Almost two years in of blogging and this will be my first favourites post, I know amongst different bloggers that this is a well liked post and I thought I'd jump on the bandwagon. 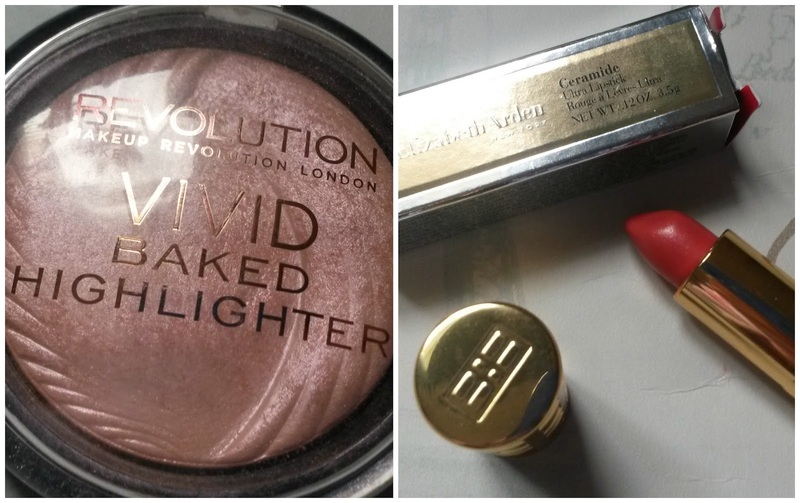 This month I've been loving the Makeup Revolution vivid baked highlighter in peach lights, I was most fortunate to get this shade in a bag I was gifted after going to the Makeup Revolution launch, and I'm so glad I did. I wasn't an highlighter wearer before but since this beauty came into my life I'm an highlighter convert. Peach lights adds the most beautiful glow to your face, it's just a gorgeous product. I would never of bought this so I can't thank the team enough for adding this to my bag and giving me the courage to go a little out of my comfort zone. You can see my full review here and it's only £3. I can't get enough of Elizabeth Arden cereamide ultra lipstick in Melon (06), though a little on the pricey side at £17.00 (from Feelunique) it very much screams luxurious from the gold packaging to the feel of it - it doesn't feel cheap at all and feels quite weighty to other lipsticks in my collection. The shade as many tones to it I'm seeing more orange then anything with slight pink/red tones, my guess is coral and comes with a lovely shimmer - full review coming soon with swatches. Soap & Glory Butter Yourself is one of my favourite body butters, not only does it smell good enough to eat it makes my skin feel so soft and hydrated. The sun made a little appearance and I reached straight for this to keep any dry skin at bay. 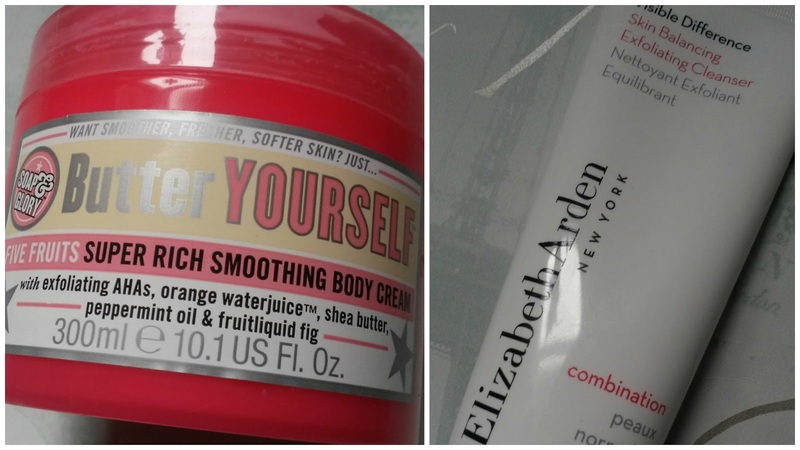 Another product I've been loving is the Elizabeth Arden visible difference skin balancing exfoliating cleanser (that was a mouthful), It feels so creamy and lathers fantastically on my facial area which can be prone to being a little sensitive every now and again. Not only does it cleanse my face it also exfoliates at the same time - which is always a bonus. A little more expensive again at £15.30 but worth every penny, I feel like my breakouts have calmed down and using this with the magnitone pulsar just worked wonders for my skin. I love TVD. I only started watching The Vampire Diaries this year and it only took me a few weeks to watch series 1-4 and I was hooked, I couldn't wait for season 5 to come on in the UK and went online in search for it, it's now finished and I was an emotional wreck. Yes they were some sad times in Season 5 but it was also a great season, for me they just keep getting better and better. I'm so looking forward to seeing what season 6 have in store but that's sometime off yet, so I'll just have to watch them again. The Sims 3! Well what can I say I've been a Sims player for as long as I can remember (we're talking primary school) and I've played on all the Sims and practically all the expansions. Since having kids my love for Sims took a little step back and I've not been on it for a few years, then a long comes a Youtube video of Zoe from Zoella and Alfie from Pointless Blog playing it and then I went on a rummage through the house in search of Sims 3 and one of my many expansion packs to install on my laptop. Fair to say my love for Sims is back. Oh my gosh, just seen Sims 4 is coming out, I want, I want, I want. I love soap and glory :) And Sims! Aw used to play that ALL the time haha. How are you Kate? 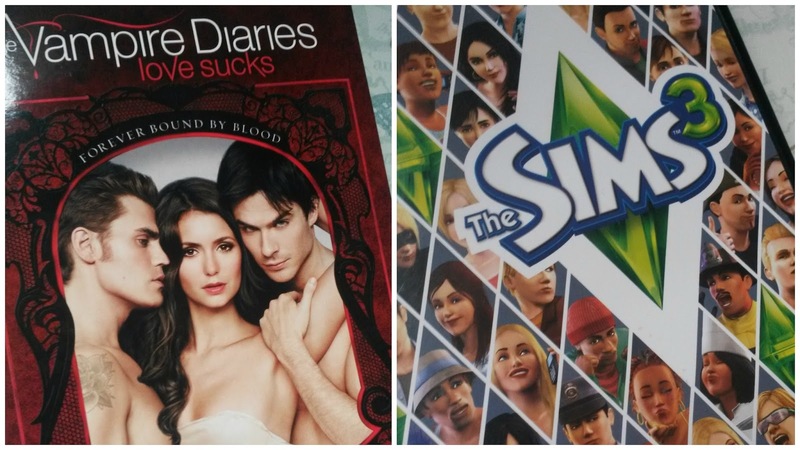 I love the Sims too, your making me want to dig out my game too lol, xoxo. I used to play the Sims all the time. Haha you made me think of it again and now I want to play it! I'd love to try the soap and glory body cream. I still love the sims (since primary school too!!) and still play it now at nearly 19!